Toshiba has announced an updated range of Satellite and Satellite Pro laptops that utilise Centrino 2 technology. The updates are across the whole range and encompass the P300-18M and the P300-19P, while the Satellite Pro models include, among others, the A300-1EA, A300-1E7 and U400-130. And it's not just the Satelitte lappies that have been given new intel chips, either. Toshiba's sleek and stylish Portégé M800 also houses a Centrino 2 chip and is out now in a limited edition 'white pearl' design. 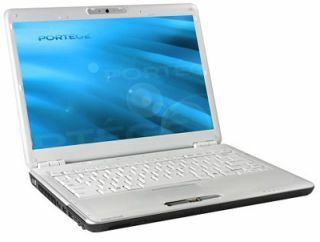 Other specs include a: 320GB hard disk drive, 2GB DDR2 (667MHz) + 2GB DDR2 (800MHz) RAM, and a 13.3in WXGA TruBrite TFT Display. The laptop is, according to Toshiba, is "perfect for the style-conscious business professional as it is for the style-conscious consumer." The Toshiba Portégé M800 is available now for £749. And lastly we come to the company's Qosmio range. And you've guessed it; the laptops have Intel Centrino 2 inside. As reported last month, the laptops also include Toshiba's new Quad Core HD Processor, which powers things like gesture control and new integrated video upscaling technology. The F50 and G50 models are available now, with pricing for the series starting at £899. The X300 model, the company's latest gaming machine, houses Intel Core2 Duo Extreme processors, up to 4GB of DDR3 RAM and dual hard disk drives with capacity of up to 640GB. There's also the welcomed inclusion of an nVIDIA GeForce graphics and a 5.1 channel Harmon Kardon sound system. The price for this laptop begins at £1,199.